This island, that seems like a well kept secret of the Greek seas, is a stop you must absolutely make during your yachting charter expedition! Its blue and white houses –a trademark of Greek maritime architecture, the delicious cuisine, the history, people, and culture, will hold on to you as you will never forget its classical beauty and charm. With a yachting charter expedition you can explore the island from every aspect and have the wonderful experience of your Greek summer vacation dreams. The geomorphology of the island is quite common amongst the Argosaronic, filled with hills where lots pine trees grow. But Poros has a lot of hidden gems scattered across it that will surely amaze you. Although barely an island from a technical aspect, the houses of Poros are painted white and blue in the likes of those located in the Cyclades while a lot of them are built at the very edge of the waterfront –their door being accessible only by boat if the sea level rises. While walking at its outer parts you will soon come to realize that boats are anywhere where there is water: in front of taverns, houses, streets, or packed at harbors, the sight is honestly fascinating. But when we pay attention to the island’s natural beauty there is more to be discovered. The well known classic Greek pebbled beaches that are simply unforgettable, are just the right place to spend your afternoon or evening. Poros’ marina is located at the south-west side of the island and is the natural border of its picturesque capital. At the harbor of Poros berthing is usually done by stern-to mooring either at the south or the north-west quay and its right-angled pontoon where caution is needed so as not to cross anchors with nearby boats! Draught at the north-west quay ranges from 2.5m along the quay to 10m on the outer side of the pontoon. The bed here is muddy and provides generally good holding. At the south quay of the harbor there is usually a lot of traffic caused by Ferries that mostly come from Piraeus, causing large swells so make sure your fenders are in the right position. Poros’ marina will provide you with a full range of services including water, electricity, port personnel, market and others. Docking costs at the port of Poros are around 8 eur. 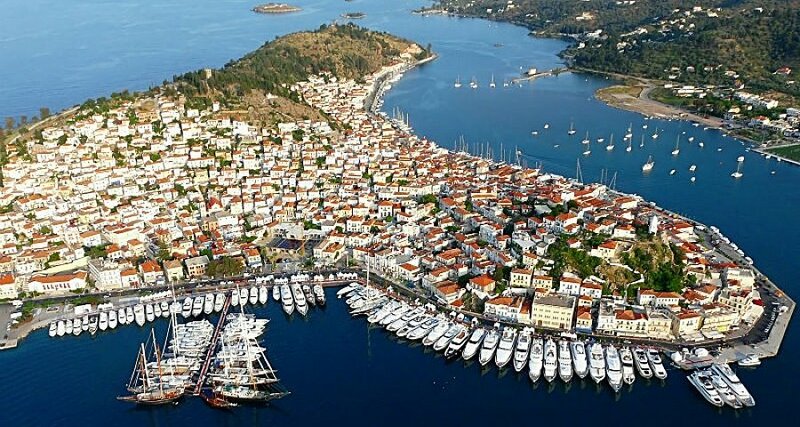 In general, Poros is quite the budget friendly place and your wallet will mostly remain undamaged during your time there. A ride with a taxi costs around 3 euros per kilometer, groceries are about 25 to 30 euros for a lush meal aboard and some essentials or if you prefer a meal at a tavern, it will cost you around 50 euros for two. If your budget is still too restricted for that then do not fear since two traditional pitas with gyro (infamous worldwide!) and something to drink, cost about 7 euros only. A staple value for every Greek island, including Poros, is of course their beaches. Poros’ beaches are absolutely spectacular, filled with treasures that await to be discovered. Walking along the island’s shores while the sun is going down is a visual that surpasses everyone’s expectations. The clear waters, the colors of the sky at dusk as well as the dense pine trees everytwhere could only make you think you are fantasizing. It is one of the most beautiful shores on the island and is surrounded by pine trees. The beach is organized around a beach bar but romantic walks across its line makes up for a beautiful and memorable experience on all its own. But the beauty that Poros exerts comes in different forms. An incredible amount of beaches are filled with people and beach bars that are an absolutely perfect example of what summer is: people are brought together to celebrate and enjoy all that this season can offer them and the fun never stops! On the other hand the beach at the old Russian naval base, located at the Russian Bay, is more secluded and the perfect place to drop anchor and swim under the radar! One of the busiest of Poros and is filled with sun beds including a beach bar while Panagitsa is organized in almost the same way. They are both perfect for getting some drinks and for having a genuinely fun time with family and friends. If you are in the mood for something more than just sailing across the waters of Poros there is a selection of places you can visit in order to get to know the island better. A signature sight of the island is the clock tower that is sitting at the very top of a hill and is the perfect place to hike up to and enjoy the unbelievably fantastic view of small boats sailing around the land on its crystal clear waters. Deciding to pack up and visit the clock tower is a well made decision and something anybody visiting Poros should do! Located on a hill and overlooking the sea, is the Monastery of Zoodochos Pigi. As many would agree the Monastery stands quietly in a charming and inviting way so everyone can appreciate its beauty. The pictures of the saints inside are beautifully hand-painted while the golden chandeliers and candles hanging from the roof are definitely something memorable. Getting to know the orthodox religion and how the appreciation that Greek islanders are showing towards it is definitely a valuable experience. Remnant of the ancient years of Greeks’ faith to the twelve gods of Olympus, the temple of Poseidon at Poros is a great site to visit if you want to get in touch with the ancient Greek culture and admire the imposing temples that ancient Greeks dedicated to their gods. Walking across its ruins whilst watching the beautiful view will make a very blissful trip for anybody. Except for all the historical sites and beaches that Poros offers, the island also has a very vivid out-life with bars, restaurants, taverns etc on almost every corner. The options are truly endless. Fishing in Poros is a very common activity among locals who set out at dawn for their daily haul and later sell it by the docks. Saganaki, an appetizer, which is a flat square of feta cheese, fried and the glazed with lemon. Souvlaki which is barbecued meat on a stick and pita gyro which is pita bread filled with meat shavings and various veggies that is then wrapped up in a cone. Only about 2 nautical miles west from the harbor of Poros, you’ll find the Russian Bay named after the Russian dockyard that was built on its shore after the Russo-Turkish war of 1877. There, you can drop anchor and perhaps spend a quiet night either by the small isle of Daskalio with its chapel that decorates the entrance of the bay or by the shore, looking at the abandoned Russian naval base and the valley of pines that stretches beyond it! Just 3 nautical miles west of the port of Poros you’ll find the beautiful bay of Vydi which offers great protection from northern winds. Drop your anchor there and enjoy the safety that this bay naturally offers while gazing at the beach of Vydi with its eucalyptus trees lined at the shore! Another interesting place to drop anchor in Poros is the Neorion Bay located at the northwest of town. Although more crowded than other anchorages, this bay is also one of the most beautiful with rich verdure growing along the shore. There, you may also pass the time on activities with the water-sports center or enjoying good food at the local taverns. For a yachting charter expedition the island of Poros is definitely a safe bet. Although busy and in the way of routes starting from Piraeus, at Poros you will have the opportunity to taste the freshest fish, visit magnificent sites, anchor in beautiful bays and swim in the unparalleled beauty of the Mediterranean beaches! Don’t miss out on stopping by!